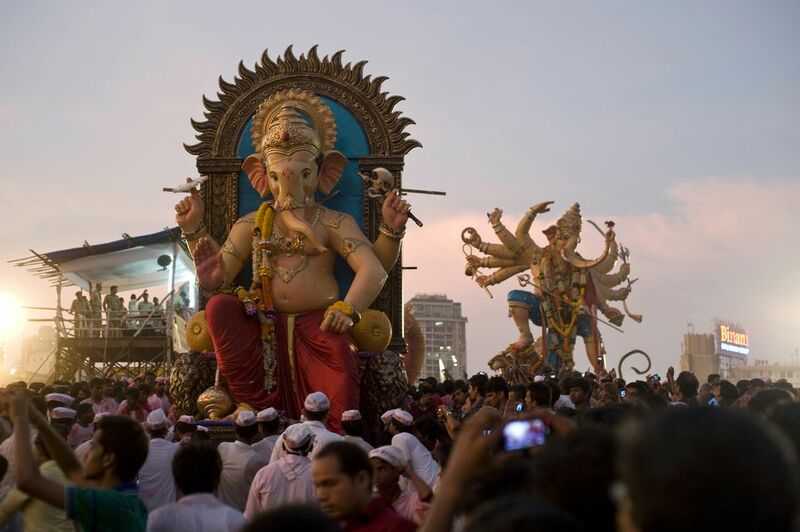 If you're planning on being in Mumbai for the Ganesh Chaturthi festival, you can make it easier for yourself by staying at a hotel that's close to the celebrations -- particularly where the statues are immersed in the sea -- as the crowds can be formidable. Most of the famous Ganesh statues in Mumbai get immersed at Girgaum Chowpatty (beach), on Marine Drive in south Mumbai. Juhu beach is another popular immersion point, along with Versova beach, in the western suburbs. These hotels in south Mumbai are the best picks around Girgaum Chowpatty for all budgets. The Marine Plaza is a relatively small hotel that has 40 suites and 28 sea facing rooms, plus a fabulous location right on Marine Drive in Churchgate. It's about 30 minutes walk south of where the immersions take place. Renowned features are the rooftop glass bottom swimming pool, Geoffry's English Pub and The Bayview 24 hour cafe (with midnight buffet, and as to be expected, panoramic views of the bay). Rates: Double rooms cost from 8,500 rupees per night, plus tax. Breakfast is included. The InterContinental Marine Drive is, as its name suggests, also on Marine Drive. However, it's located a bit closer towards Girgaum Chowpatty than the Marine Plaza. Walking time is about 20 minutes. It's a boutique luxury hotel with 57 guest rooms, three restaurants, rooftop swimming pool, fitness center, and one of Mumbai's most unforgettable bars called Dome. Rates: Expect to pay about 11,500 rupees and upwards per night for a double, plus tax. The West End Hotel is a less costly option, situated a couple of streets back from Marine Drive in the same area. The hotel has 80 rooms in an old style building, constructed in 1948. It's a little tired looking in places and is undergoing renovation. However, rooms are big, food is great (albeit overpriced according to some guests), and staff are really friendly. Rates: Rooms go for upwards of 6,000 rupees, plus tax, for a double. Not to be confused with Bentley's Hotel in Colaba, this hotel is located on Marine Drive just north of the InterContinential. It's one of Mumbai's best cheap hotels and has 20 rather small guest rooms in an old apartment building. Feedback has improved since the rooms were renovated in 2012 and attached bathrooms were added. Rates: Expect to pay around 3,000 rupees upwards per night for a double, plus tax. In the other direction, the Krishna Palace Residency is near Grant Road Railway Station, about 10 minutes walk north of Girgaum Chowpatty. It's a modern hotel with 68 rooms, two specialty restaurants (one fine dining and the other vegetarian), bar and fitness center. The great thing about staying at this hotel is that it's close to Khetwadi so you'll be able to see the Ganesh statues in all the lanes, including the Khetwadi Ganraj, as well as join in the processions. Rates: Rooms are priced from 5,800 rupees, plus tax, per night for a double. Another of Mumbai's top budget hotels, Hotel Kum Kum is also in the vicinity of Grant Road East. Girgaum Chowpatty is about 20 minutes walk from the hotel, which is renowned for its congenial staff and clean rooms (although the cheapest ones are quite tiny). The hotel also has a large terrace and rooftop restaurant that serves tasty food prepared with fresh ingredients. You can even see it being prepared in front of you. There's free wireless Internet and decent coffee as well! Rates: From 2,000 rupees per night, plus tax. It's excellent value for money!